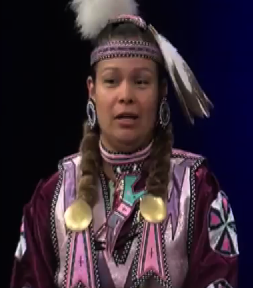 This Sunday October 20th on Native Voice TV show, (Comcast Ch. 15 at 7 PM) Cihuapilli Rose Amador has Lucha Diaz (Turtle Mtn. Chippewa/Chicana) on NVTV show. Diaz of Turtle Mt. Pembina Band of Chippewa (Belfield, North Dakota). Diaz is 4th generation of California, a mother of 2 girls and currently enrolled at San Jose State University’s Engineer department. Diaz speaks about how extremely it is important to get a higher education degree in order to live in California. Diaz is politically active to support Native American and Latino cultures.